Calling all vegans, veggies & pizza lovers! Calling all vegans, vegetarians and Italian pizza lovers – Brighton welcomes a new addition to the Italian food scene; PUREZZA. 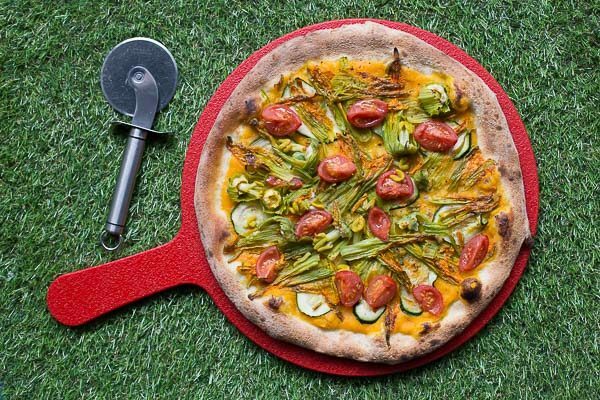 As UK’s first plant-based pizza restaurant, Purezza (‘purity’ In Italian) offers an exciting array of vegan and vegetarian options to a beckoning audience. Formed by ex-marketer Tim Barclay and his partner Stefania Evangelisti in 2015, the duo left the chaotic London scene to launch their food dream in Brighton’s colourful Kemp Town. Purezza, with the aid of top Italian chefs and fresh ingredients, caters for those who are lactose intolerant, gluten intolerant, health conscious, plus vegetarians and vegans alike. The menu boasts only plant-based cheeses on their pizzas, most often a soy based however you can find additions coconut, cashew and almond cheese. A simple resto setting with an eco-edge, coupled with a fun faux ‘grass’ ceiling and sky themed floor – puts you instantly at ease in this quaint local pizzeria. We started with Purezza’s take on a ‘Hawaiian’: a pizza using Seitan ‘salami’ as a protein base mixed with pineapple and vegan cheese. The highlight was the cloud-like, fluffy organic dough base, and although perhaps not comparable to its controversial rival ham topping, it was still a satisfying choice. Next we moved on to the adventurous ‘Nacho’ Pizza, a comical take on the Mexican favourite side dish. This pizza had an interesting guacamole base mixed with red peppers, sweetcorn, red onions and was topped with crispy nachos and vegan cheese. Perhaps not the healthiest of options but was a great novelty pizza and ideal for sharing. However our personal favourite of the day, was Purezza’s ‘Zucchini flower’ masterpiece – debuting soon on their Special Pizza menu. A botanical looking pizza filled with a butternut squash base, cherry tomatoes and freshly torn basil. The striking zucchini flowers were strewn on top in bountiful fashion and added a very flavourful and unusual texture to the dish. Whilst we were tempted by the sounds of the ‘folded calzone dessert pizza’, a perfect blend of crushed hazelnut, walnuts and pistachios in a chocolaty goodness (on the wishlist for next visit), we instead opted for a quick vegan brownie to-go, washed down by a true Italian espresso. Purezza is a clever new addition to Brighton’s food scene and somewhere that welcomes all culinary tastes and pizza lovers, whether vegan or not! We hope to see more Purezza pizzeria’s popping up in Sussex and neighbouring towns soon – as a refreshing change to the heavy pizza parlours we have so become accustomed to.